HousingWorks conducts policy research on timely and localized topics related to affordable housing. Our research keeps the community informed on issues related to affordability and enables community leaders to make better-informed policy decisions based on reliable data. 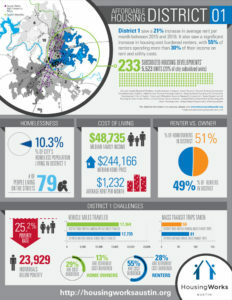 Every year, HousingWorks researches and publishes an analysis of all 10 city council districts in Austin. Working with demographers, business organizations, nonprofits and other sources, we compile data related to housing, income and other factors that affect household affordability. That includes homelessness, home prices, rate of home ownership, amount of subsidized housing and transportation costs. We present the data in graphics that are easy to understand. HousingWorks was involved in the efforts to pass the $65 million affordable housing bonds in 2013 and $55 million housing bonds in 2006. 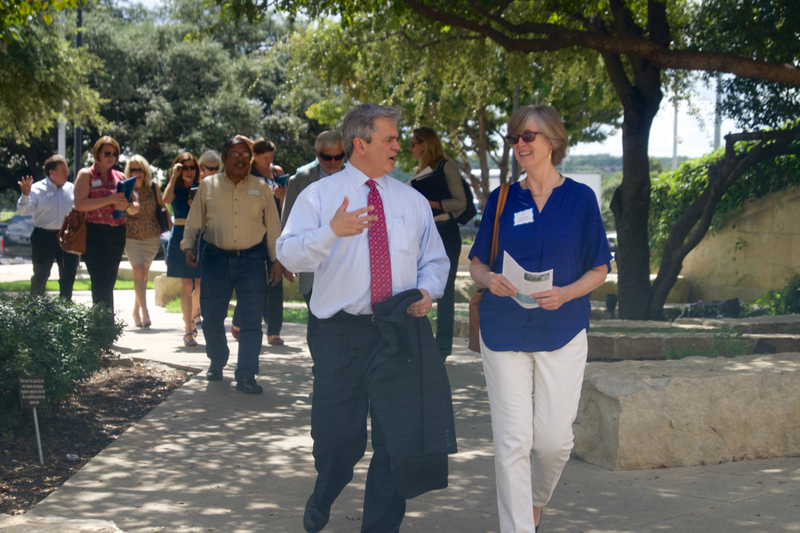 We are committed to keeping Austin voters apprised about the developments and other housing initiatives on which funding from these bonds is spent, how many affordable units they are bringing to Austin and the overall economic impact they are generating for Austin. Click below to view the economic impact reports we commissioned through Civic Economics. 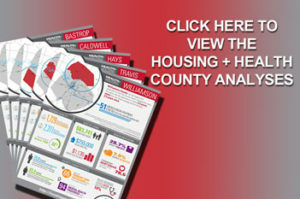 Our Housing + Health county analysis combines data from a number of sources to highlight the health and housing characteristics in Austin’s five-county region. Housing quality, stability and affordability all play a major role in determining the health of families and individuals. We see stark differences in housing conditions, affordability, and health outcomes between the five counties. Click on the image to the right to view the analyses. Transit + Affordability Forum: In conjunction with the UT Community Entrepreneurship and Development Clinic, HousingWorks Austin evaluated the importance of affordable housing in competing for federal New Starts funding. Building and Retaining an Affordable Housing, a ground-breaking report was the result of a year-long collaboration with the Urban Land Institute Austin, the Real Estate Council of Austin, and the Austin Area Research Organization. In 2013, HousingWorks contracted with Civic Economics to complete a comprehensive evaluation of the economic impact of the 2006 affordable housing bonds. 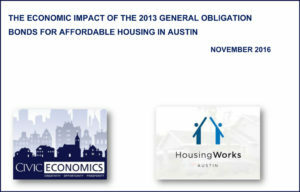 HousingWorks and Civic Economics presented the findings to City Council in April 2013. The research showed that the City’s initial $55 million in affordable housing bonds will result in $865 million in economic impact over the next 10 years. The results were instrumental in City Council’s decision to put $65 million in affordable housing bonds on the November 2013 ballot.